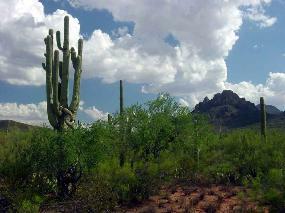 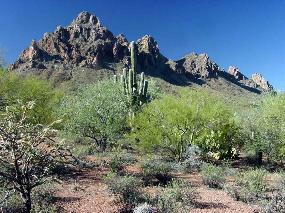 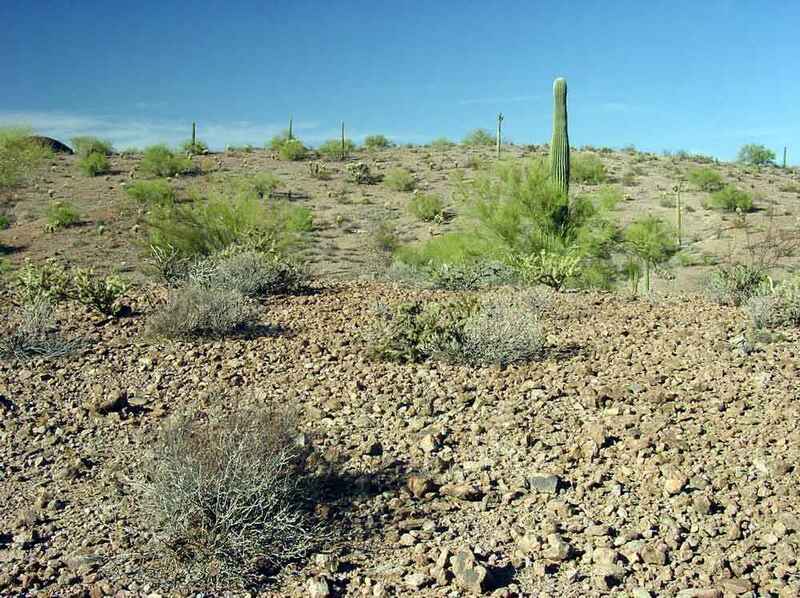 Above: In contrast with the Lower Colorado River Valley Sonoran Desert, Arizona Upland (AZU) is well-developed in IFNM. 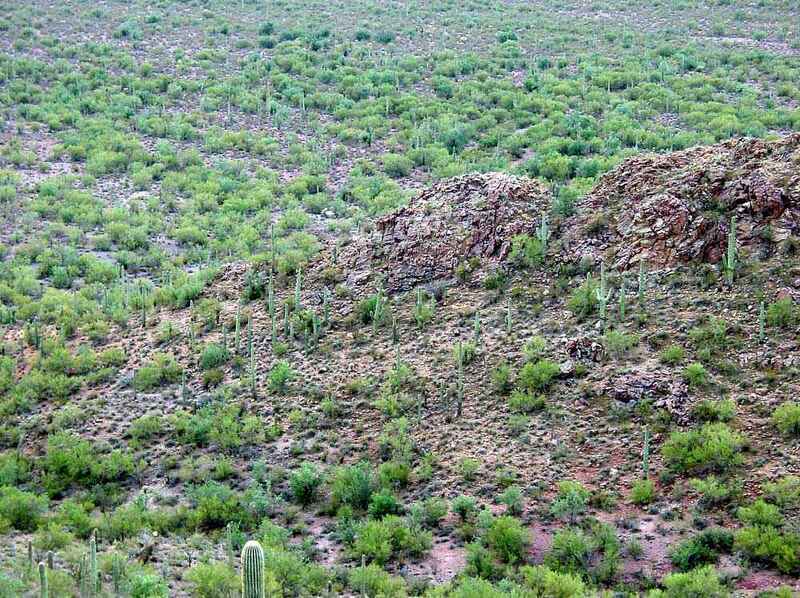 In addition to the terrain being more hilly with narrower valleys, AZU vegetation is much more dense because of the greater rainfall. 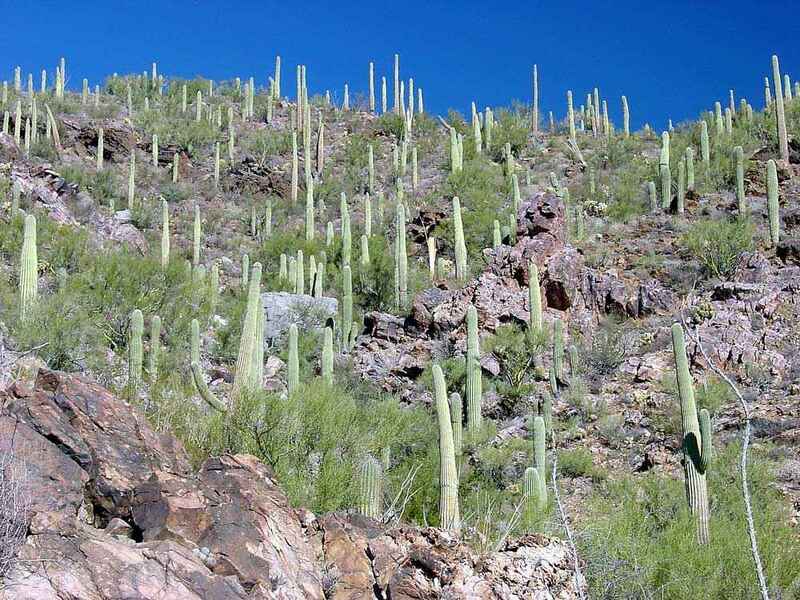 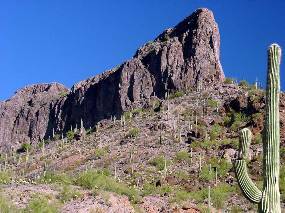 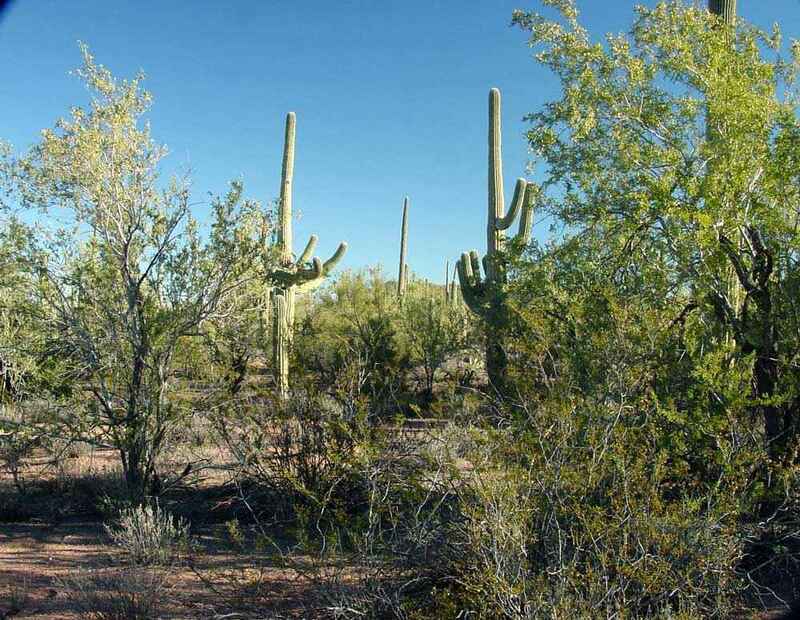 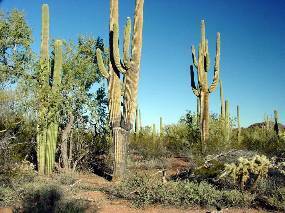 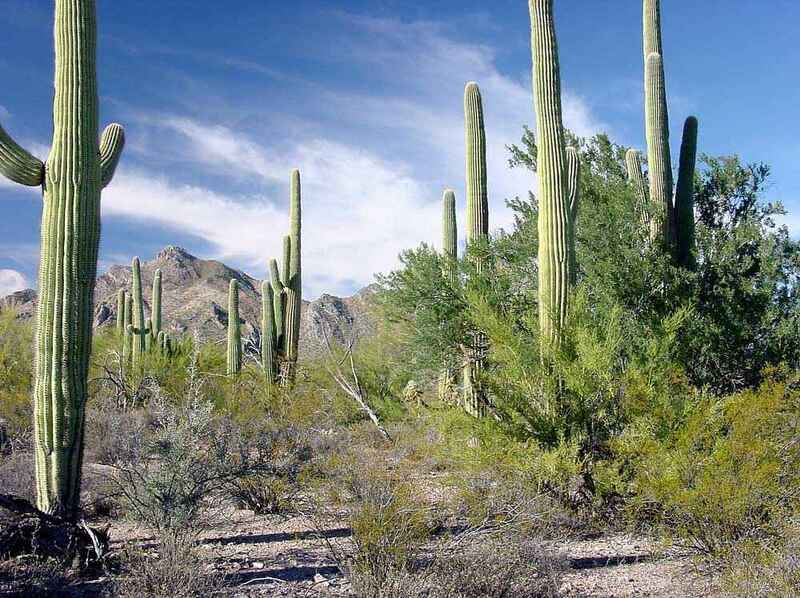 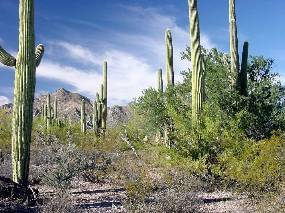 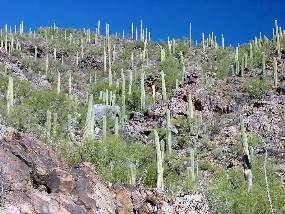 Trees and saguaros grow abundantly on the slopes as well as outside of washes on the bajadas and valley floors. 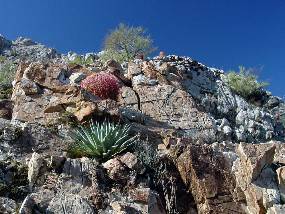 Above: Dense AZU growing on the upper bajadas of Wolcott Peak (Ragged Top, left) and the Silver Bell Mountains. 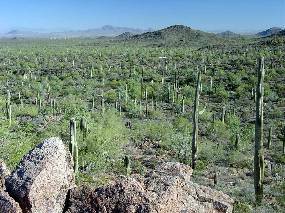 Above: Dense AZU woodland on the lower bajada of Ragged Top. 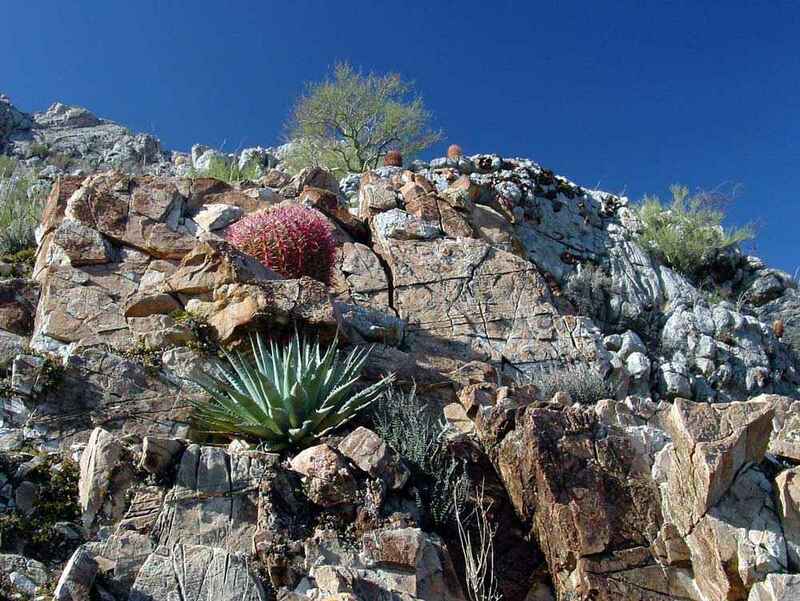 Above: Dense AZU woodland on the lower bajada of the Silver Bell Mountains. 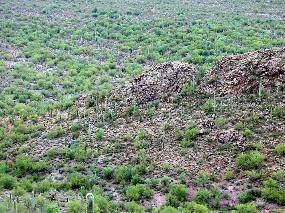 Four surrounding images : Dense AZU woodland surrounding the Waterman Mountains. 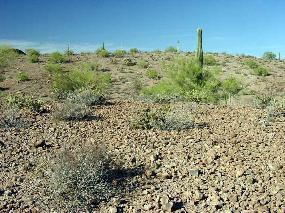 Above right: The dead tree on the left is a foothill palo verde. 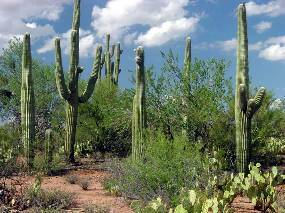 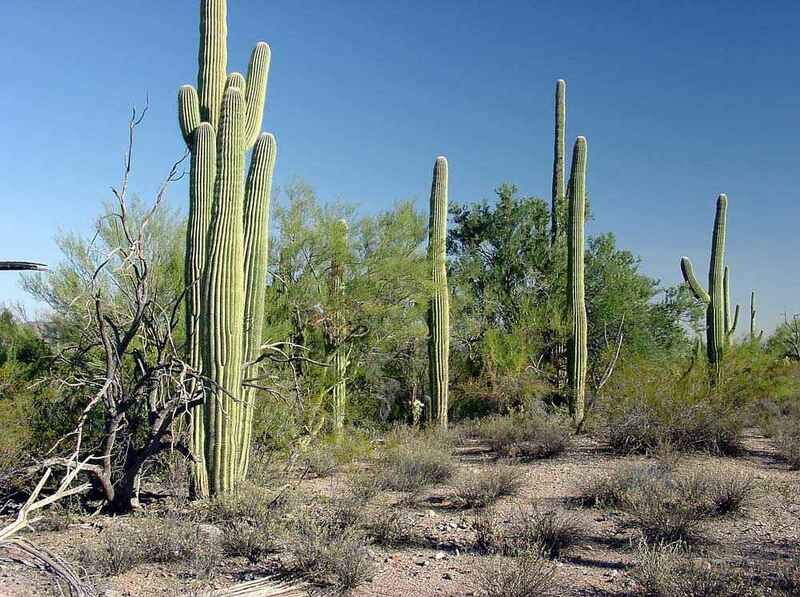 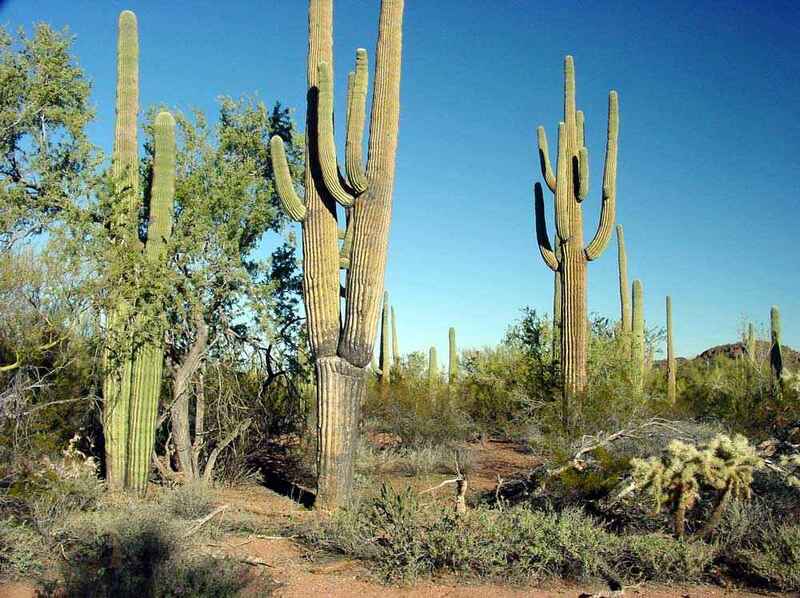 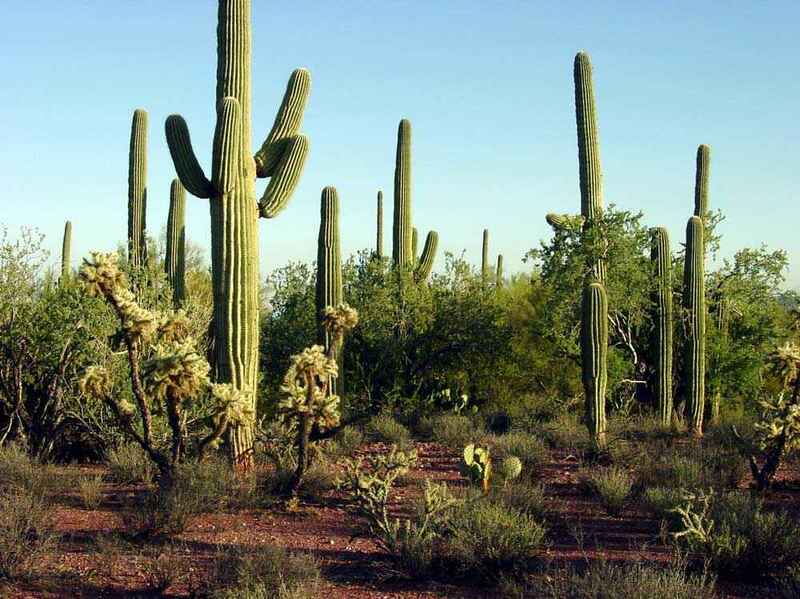 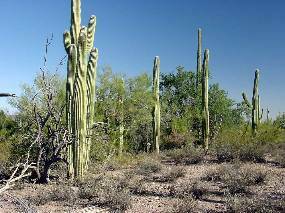 It was probably killed when the saguaros, which the tree sheltered when they were seedlings, grew up and their shallower roots intercepted the sparse rainfall. In contrast, ironwoods (right background) seem never to be killed by the saguaros they nurse. 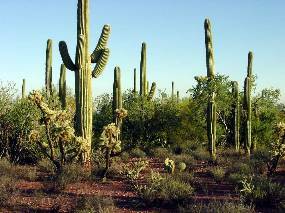 They are more drought tolerant than palo verdes. 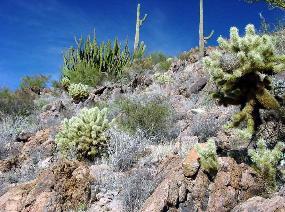 Above: Sparse AZU in the Sawtooth Mountains which are on the more arid western side of IFNM. 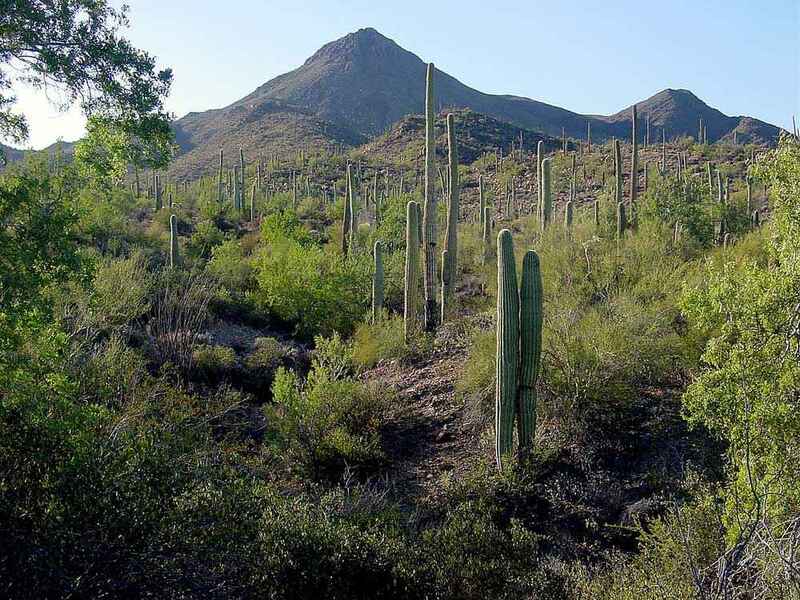 Above: On the rockiest slopes the trees and saguaros may become sparse, but the vegetation is still much more dense than on Lower Colorado River Valley slopes. Left: Roskruge Mountains; right: Waterman Mountains. 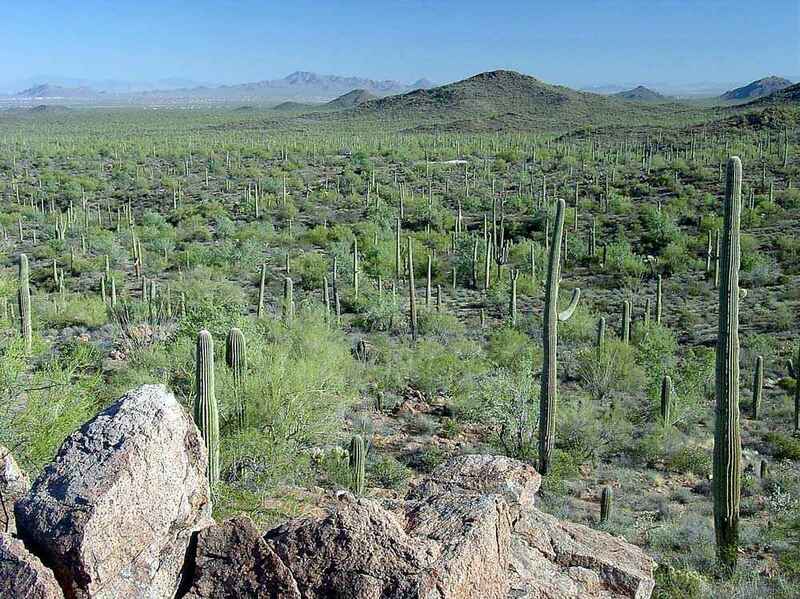 View east from Cocoraque Butte in the Roskruge Mountains to the Tucson Mountains (location of the western portion of Saguaro National Park and the Desert Museum). 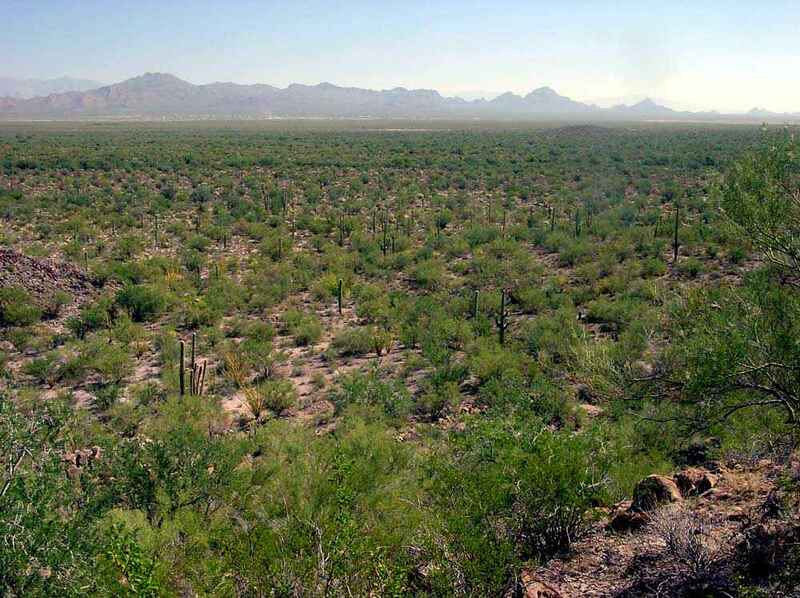 The AZU woodland on the slopes and adjacent bajada extends as far as the first major wash indicated by a horizontal line of trees (which are mostly ironwoods). 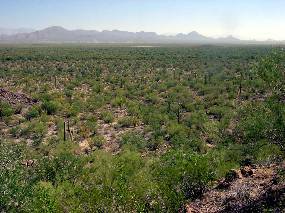 Beyond is Lower Colorado River Valley vegetation, in which the green ribbons are mostly velvet mesquite trees in washes surrounded by creosotebush flats (the brownish areas).